Oppo, a Chinese mobile phone manufacturer has launched its flagship Smartphone N3 in India and since then, it has created a buzz in the mobile market. It is a feature-rich phone that comes with amazing features and its USP is its rotating camera module. It is a dual-SIM phone supports 4G-LTE networks as well as other functionalities making it capable to compete with some of the high-end phone by the giants of Smartphone markets. It has captured the global market, but will it be able to capture the Indian market and lure the customers with its features? Let’s have a closer look at the various features of this new phone. 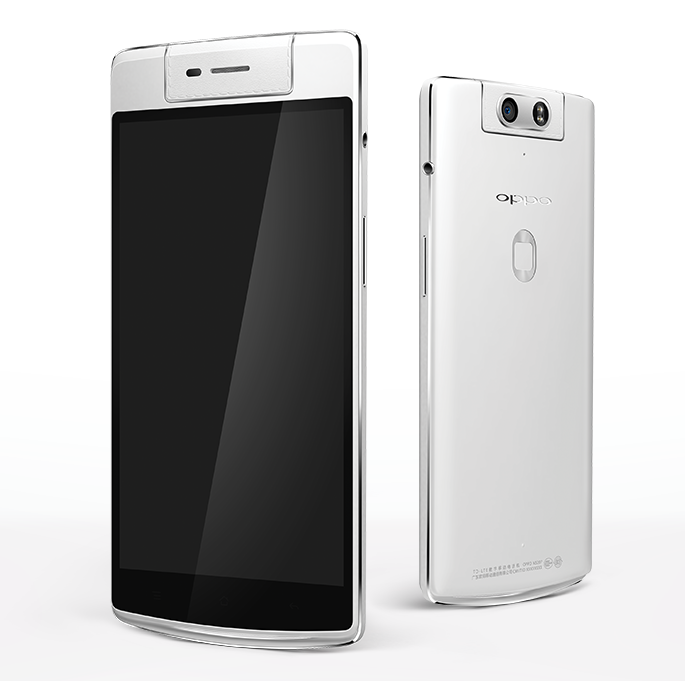 The new N3 from Oppo looks quite similar to its predecessor N1, even though there is a slight modification in the design. It features sleek and classy design with aluminum casing. It has a plastic cover on the rear panel that lends a sturdy look to it. However, the faux-leather is used in the turn around camera mount on the front panel, looks odd and I personally didn't like it. In fact, it does not match with the clean matte finish of the phone. It is 9.9 mm thick and weighs 192 gm. It looks quite similar to Samsung Galaxy Note 4 owing to its size. A metal band on the side adorns the phone, which lends amazing look to the phone. It features a microSD memory card slot and a 3.5 mm headphone jack. It has a fingerprint sensor along with a glowing notification light known as Skyline in the arc made of metal at the bottom of the device. It is equipped with 5.5 inch IPS LCD Full HD display with a screen resolution of 1920 x 1080 pixels with a density of 403 ppi. The screen is protected from scratches as well as fingerprints with Corning Gorilla Glass 3.0. The slim bezel offers enhanced viewing angle and images as well as videos can be viewed with utmost clarity. The display and the design of the phone is quite impressive, expect for the turn around camera mount. The Oppo N3 runs on Android v4.4 KitKat operating system. It makes use of ColorOS 2.0 instead of the standard version of Android, but with slight modification to the appearance of vanilla Android. The device has some major tweaks with a whole array of apps, which are featured in the home screen just like the iOS from Apple. However, it fails to create the appeal that iOS does. For enhanced performance, it is equipped with two powerful processors, namely Qualcomm Snapdragon 801 chipset and quad-core 2.2GHz Krait 400 processor coupled with Adreno 330 GPU and 2 GB RAM. The built-in internal storage is 32 GB, which is expandable up to 128 GB using a microSD card. Even though, it is powered by dual processors, the performance of the device isn't up to the mark as there were few glitches. Nevertheless, it is a decent device. The most enticing as well as interesting aspect of this new device is its swivel camera. It just has a single lens and sensor, which revolve on a hinge. The rotating camera has been enhanced with a motor, which automatically rotates when the front camera button in the camera app is started. It makes use of the Omnivision OV16825 along with Schneider Kreuznach certified 16-megapixel 1/2.3-inch sensor. The image quality is quite impressive and is capable of capturing images with a maximum resolution of 64 MP. The pixel size is 1.34 micron and 5 optical lenses, which comes with PI 2.0+ technology. This technology enables the camera to track the objects while moving and is capable of rotating up to 2060. It also comes with multi-frame synthesis super-sampling technique, which is capable of combining with several low resolution images to produce ultra-high resolution to capture even the minutest details. It also comes with dual LED flash and can record 1080p videos at 30fps and 60fps and 720p slow motion video at 120fps. The camera has several other features that enhance the photography experience. The O-Click Bluetooth remote comes in the bundle that can control the camera and locate the device with ease. The phone supports 4 LTE (150/50Mbps), GSM 850/900/1800/1900MHz, WCDMA B1/2/5/8 and FDD-LTE B1/3/7/20 networks. Other connectivity options include USB OTG, Bluetooth 4.0, Wi-Fi Direct, GPS, 5G Wi-Fi 802.11 b/g/n/a/ac, Wi-Fi Display and NFC. It also has Distance sensor, Light Sensor, 4D Gyroscopes, G-sensor and Touch access. This dual SIM phone supports Micro SIM as well as NANO SIM. The phone gets its power from a non-removable 3000 mAh Li-Po battery with Flash Charge. The battry backup of the phone is decent but the battery is quite smaller than many of its rivals. However, the best part is it charging time is quite fast. With a price tag of Rs. 42,990, the new N3 from Oppo is a decent phone. After looking at its various features, it is quite an impressive phone. The shooter is definitely its USP and it has been capable of living up to the expectations as claimed by the manufacturer. However, in terms of performance, there is a little glitch; however, the camera is sure to lure the consumers. The price as well seems to be a bit higher as per its performance. In my opinion, except for the camera and ofcourse the design and display, it is just an average phone.